Besides horizontal text orientation, you can also display text vertically or at an angle. You can change the orientation of the text go to HOME >> Alignment >> Orientation. 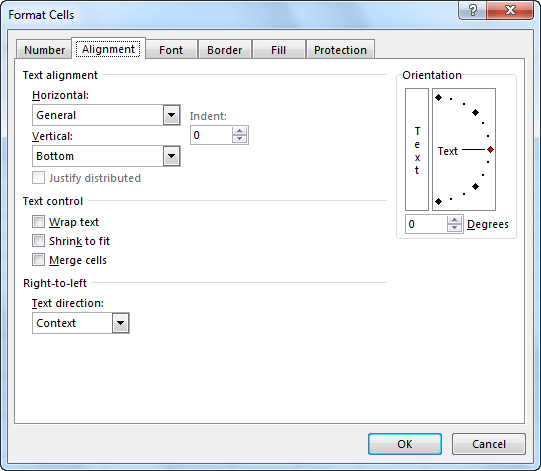 In the drop-down menu, you will find 5 default text orientation types. Three of them are vertical and two diagonal. 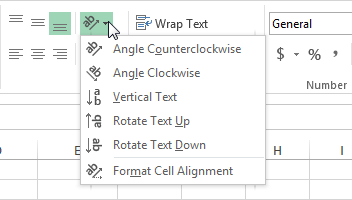 If you need more control over the text orientation, click the last item in the list- Format Cell Alignment. On the right side of the box, in the orientation area, you can set text orientation with an accuracy of one percent. Look at the following examples.